Poster title goes here, containing strictly only the essential number of words Template NSF Grant # Author’s Name Goes Here Author’s Major Goes Here. Template NSF Grant # Author’s Name Goes Here Author’s Major Goes Here Author’s Address Goes Here Introduction Method Results Importing / Inserting Files Images such as photographs, graphs, diagrams, logos, etc, can be added to the poster. To insert scanned images into your poster, go through the menus as follows: Insert / Picture / From File… then find the file on your computer, select it, and press OK. The best type of image files to insert are JPEG or TIFF, JPEG is the preferred format. Be aware of the image size you are importing. The average color photo (13 x 18cm at 180dpi) would be about 3Mb (1Mb for B/W greyscale). Call MIU if unsure. Do not use images from the web. Please use this template as a guide. This formatting is on powerpoint. You may use any program to create your poster. Make sure your template is 36 inch Height x 48 inch Length. This file is already in the correct template size. Remember to use your creativity to set your poster apart from the other students. How to use this Poster Template Simply highlight this text and replace it by typing in your own text, or copy and paste your text from a MS Word document or a PowerPoint slide presentation. The sub-title text boxes can be moved up or down depending on how big or small your ‘Introduction’, ‘Aim’, ‘Method’, ‘Results’ and ‘Conclusion’ are. The title text / font size should be around 40 points. Arial, Helvetica or equivalent. (Keep all title font sizes the same size throughout the poster). The body text / font size should be between 24 and 32 points. Arial, Helvetica or equivalent. (Keep all text font sizes the same throughout the poster). The color of the text, title and poster background can be changed to the color of your choice. Consider the Importance of Confidentiality Remember to discuss whether certain equipment, techniques, locations, people, or anything else should be omitted from your poster. If necessary, think of a creative way to discuss what you are doing, without naming what you are doing. 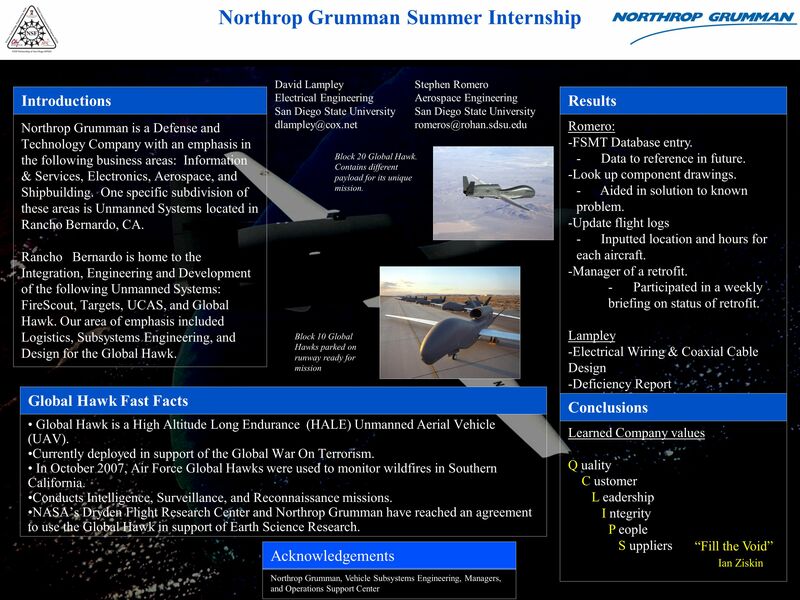 Tips for Making a Successful Poster Simplify everything, avoid data overkill. Headings of more than 6 words should be in upper and lower case, not all capitals. Never do whole sentences in capitals or underline to stress your point, use bold characters instead. When laying out your poster leave breathing space around you text. Don’t overcrowd your poster. Try using photographs or coloured graphs. Avoid long numerical tables. Spell check and get someone else to proof-read. Title font sizes should all be the same throughout the poster Text font sizes should be the same throughout the poster Captions to be set in Times or Times New Roman or equivalent, italic, between 18 and 24 points. Left aligned if it refers to a figure on its left. Caption starts at the top edge of the picture (graph or photo). Left. Alberto Vasquez at San Diego Coastkeeper diluting samples for coliform & enterococcus testing Conclusion Captions should describe what the item is, what the subject is doing. Example: Mariela Medina and Hersy Enriquez doing a site visit at the City of Oceanside new facility construction Notes about Graphs For simple graphs use MS Excel, or do the graph directly in PowerPoint. Graphs done in a scientific graphing programs (eg. Sigma Plot, Prism, SPSS, Statistica) should be saved as JPEG or TIFF if possible. Aim/Purpose of Goal Include NSF Grant # s for the campuses of each teammate City: NSF Grant # DUE SDSU: NSF Grant # DUE SWC: NSF Grant # DUE SPSD Logo Photos of yourself in action (remember to get supervisor approval) Acknowledgements Remember to enthusiastically thank your mentors, colleagues, the company that hosted you, your MESA director, the National Science Foundation and anyone that helped you with this professional development experience. Captions to be set in Times or Times New Roman or equivalent, italic, 18 to 24 points, to the length of the column in case a figure takes more than 2/3 of column width. Captions to be set in Times or Times New Roman or equivalent, italic, 18 to 24 points, to the length of the column in case a figure takes more than 2/3 of column width. 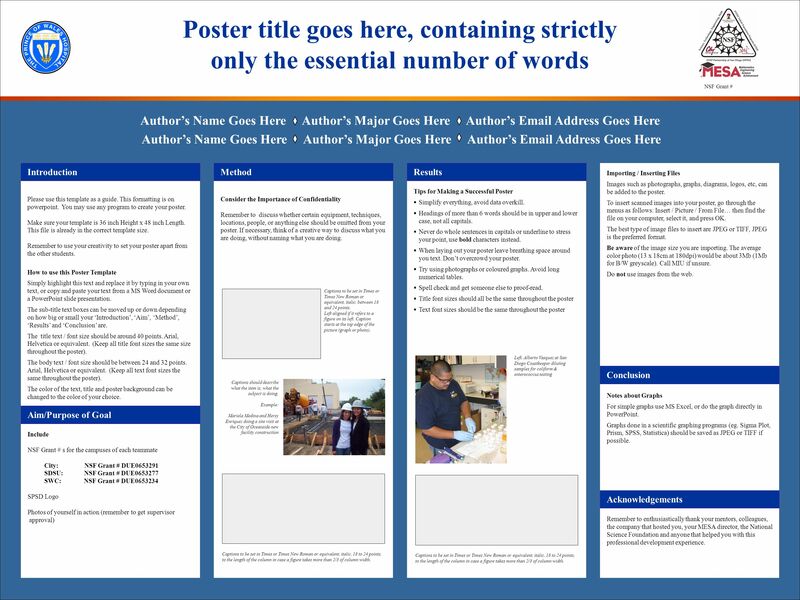 Download ppt "Poster title goes here, containing strictly only the essential number of words Template NSF Grant # Author’s Name Goes Here Author’s Major Goes Here." Poster title goes here, containing strictly only the essential number of words... Author’s Name/s Goes Here, Author’s Name/s Goes Here, Author’s Name/s. Poster title goes here, containing strictly only the essential number of words... Introduction First… Check with conference organisers on their specifications. Color Coded Templates Categories are mentioned in the Titles. First Name Last Name, Title; First Name Last Name, Title; First Name Last Name, Title Department and/or School, University of California, San Francisco. Poster title (for a general audience, use minimum number of words) Name(s) of author and faculty advisor University of Wisconsin – Whitewater, Department. Author’s Name/s Goes Here, Author’s Name/s Goes Here Electrical and Computer Engineering Department University of Puerto Rico at Mayagüez The page size. PRESENTING YOUR RESEARCH AS A POSTER PLEASE BE SURE TO READ AND FOLLOW ALL GUIDELINES AS POSTED IN THIS DOCUMENT. IF YOU HAVE ANY QUESTIONS, PLEASE SEE. Program Sponsors: April 3 & 4, 2013 Student Names Here, Student Names Here Advisor: Advisor’s name here Sponsor: > Liaison: > The page size of this poster. Conference on Interdisciplinary Musicology, Graz/Austria, April 2004, Title of poster: Corresponds to the title of. (Suggested title) Introduction & Aim How to use this poster template… Simply highlight this text and replace it by typing in your own text, or copy and. A succinct but catchy title: Not too long List authors names here Institutional Affiliations listed here Acknowledgements Repetition is useful in some. More PowerPoint Shortcuts Alt+F9 toggles guidelines on and off Esc de-selects all objects Alt (while dragging object with mouse) lets you move the object. Glassy – Winged Sharpshooter: Author’s Name/s Goes Here, Author’s Name/s Goes Here Address/es Goes Here, Address/es Goes Here Introduction First… Check. Authors, FIRST NAME INITIAL, SURNAME, presenting author(s) underlined, Affiliations1 numbered in superscript) e.g. B. SMITH 1, N. HARRISON 2 2 and P. MATTHEWS.